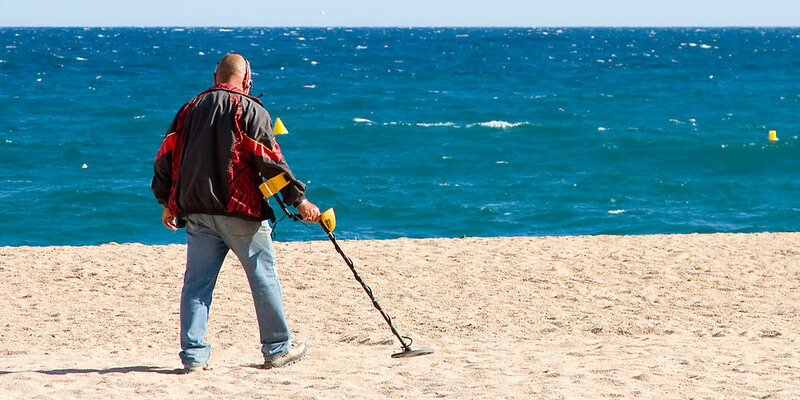 Where Are The Best Places to Use a Metal Detector? You can find buried treasure almost anywhere. Whether you’re looking for ancient relics, coins, jewellery or gold nuggets, there’s plenty to be uncovered. Choosing the right search site increases the chance of a big find though. Places with heavy footfall to replenish items, sites of historical activity, or those that haven’t been searched by other detectorists, are often the most fruitful. After all, trespassing with a metal detector is still trespassing. So you need to check the rules and ask if there’s any doubt. There can be serious consequences for getting caught – including fines and your metal detector being confiscated – so it’s not worth the risk. Don’t be put off though! Getting permission isn’t always easy, but you’ll be surprised at how often it’s possible – even when dealing with private landowners. The key is to choose the right hunting grounds, so when you get permission the chances of a big find are higher. To help you on your quest for hidden treasure, here are ten of the best places to hunt. Note: Always replace plugs and take litter with you. Aim to leave your search site in a better condition than when you arrived. You’ll be much more likely to be invited back! Your back yard might not be the most exciting place to search for treasure, but it’s a great place to test a new detector and drill that smooth, long sweep. I often recommend new detectorists bury different items in their garden to learn how their detector reacts to various types of metal (this is known as a test garden). There’s always the chance of finding an unexpected item too. You never know what coins, jewellery or other items you or previous owners could have dropped. Your back yard is also one of the few places you don’t need to worry about getting permission! Tip: If you haven’t bought your detector yet, take a look at my top list. I’ve included several categories depending on your budget and what you want to find. Once you’ve exhausted your back yard, the obvious next step is to ask friends and family if you can search their property. Yards are often small and unlikely to contain ancient relics, but there’s always a chance of an exciting find. You can even take this a step further and ask people with large gardens in your neighbourhood. As long as you’re polite and open about your plans, many people will be intrigued by what’s hiding in their garden. Loads of coins and other valuable items are lost at sporting events. People are distracted, jumping around, and generally not concentrating on what could be falling out of their pockets. The downside is that many detectorists know this. So, for best results, aim to get to a stadium or bleachers soon after a game ends. Sports stadiums are private property, so make sure you get written permission. The general rule of metal detecting sites is that more footfall leads to more lost items. As this is the case, parks are one of the best places to search for coins or jewellery. Items are constantly replenished by people having picnics, playing games or just walking their dog. Searching after events or public gatherings can yield even better results. You’ll usually need permission to dig plugs in public parks though. Be prepared for odd looks from other park users too. The combination of water, slippery sun lotion, and playing vigorous games makes it easy to lose items at the beach. This means jewellery, coins and other valuables are replenished each day. Tidal forces also uncover older items, making beaches one of the best places to hunt. Most public beaches allow metal detecting, although you may still need to apply for a permit. Private beaches are a different matter, as you’ll need written permission. The only downside to beach metal detecting is that it can be a competitive spot. Try to go late on busy days or after storms for the best chance of finding a valuable item. Tip: Tides often wash several items into pockets. Make sure you keep scanning after finding an item, as there may be multiple in the same location. Relics, jewellery and coins can be found almost anywhere. But gold nuggets tend to be found in more specific locations. For this reason, gold prospecting requires in-depth research and an understanding of where nuggets are most likely to be uncovered. As a beginner, stick to places where large gold nuggets have been found in the past, as this increases the chance of a similar find. You’ll also need a different type of detector when searching for gold. High-frequency VLF or pulse induction detectors are best for cutting through mineralisation and detecting small nuggets. For more information, read our guide to the best gold metal detectors. Buildings come and go, but churches have often occupied the same location for hundreds of years. This makes them prime spots for finding both modern jewellery and older artefacts. Of course, you should always get permission and never search burial grounds. Doing so is disrespectful and is likely to get you quickly thrown out. Instead, concentrate on where people might sit or walk. The ground around big trees and pathways are good places to start. There are hundreds of civil war battlefields across the United States. And in Europe, there are battlefields from both ancient times and both world wars. If you’re interested in finding historical items, these sites are an excellent choice. The downside is that major battle sites have been searched many times by other detectorists. That doesn’t mean you won’t get lucky though. If you find a historical item, track the location and tell the local archaeology department. They’ll be grateful to hear about what you’ve found. Dog walkers, trail runners, mountain bikers and hikers regularly use woodland paths. This makes them a great place to find dropped items. There’s also the chance of finding older relics in woodland. Trails and footpaths might change over the years, but you can bet people walked the same woodlands in the past – especially if it’s close to a town. As with all locations, check whether you need permission. Just because woodland has a public path doesn’t mean you’re allowed to detect there. It’s not a coincidence that many of the biggest metal detecting finds have been in fields. Farming land has often been used for centuries and may not have been searched before. Ploughed fields can be particularly fertile hunting grounds. Older soil is recycled to the surface, bringing hidden objects with it. While any field can yield buried treasure, spending time researching can pay off. Are there fields in your local area that hosted a historical event? Was there once an old farmhouse? Or did the town use a certain field for local meetings? Your library is a good place to start researching, as you can find local plans, newspapers and other historical documentation. It can also be helpful to talk to people who’ve lived in the area for a long time. Of course, you’ll need written permission to hunt in private fields. If you can get access, there might be some big hauls waiting though. 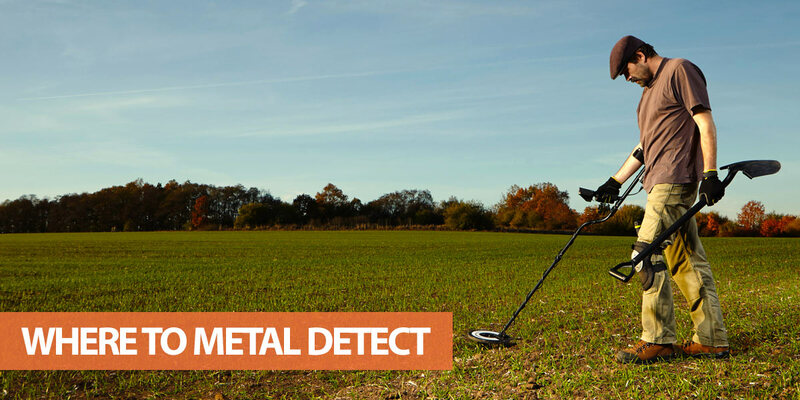 If you’re new to metal detecting, it can be hard to know where to start searching. The good news is that you can find hidden coins, jewellery and other treasure almost anywhere. It’s worth thinking about what you’re most interested in finding though. For coins and modern items, parks and stadiums are great places to hunt. Churches and battlegrounds are best for historical artefacts. But the easiest place to get started is the beach. The continuous supply of new items – both from visitors and tides – makes it more likely you’ll hit something. I also recommend checking out our metal detecting tips page for some quick ways to improve your chances. Remember, the best way to learn is to get out there and hunt. Research is important, but don’t get bogged down in finding the “perfect” hunting ground. Good luck!